Clare Furniss | COUNTDOWN TO YALC 2015! Author of The Year of The Rat and How Not to Disappear. I’m desperately busy at the moment trying to finish the edits for my next book, How Not To Disappear, which will be out in January 2016. I’m nearly there (I think) but as usual it’s taking way longer than I hoped! So it’s good to have something to look forward to, and I’m counting down the days to YALC, a chance to celebrate YA with lots of other authors, bloggers, and readers. It takes place on the 17th to 19th July at London Film and Comic Con and there’s an incredible line-up this year including my childhood hero Judy Blume. Judy’s books were a huge part of growing up for me. They were probably the first books I ever read that understood some of how it felt to be me which is one of the brilliant and important things that YA books can do. Adolescence can be lonely, and it can be a time when you feel that no one feels the way you do. Books can show you that you’re not alone, and that’s a powerful thing. I’m really looking forward to my panel event with Carnegie winner Kevin Brooks, Jenny Valentine, Moira Fowley-Doyle and Sarah Pinborough on Sunday 19th. We’ll be talking about Troubled Teens: dark subjects. How dark is too dark? Are there subjects that shouldn’t be covered in writing for teenagers? Is it patronising to teens to think they can’t handle tough subjects? Or do dark books feed teenage fears? Is it all about how the subject is handled by the author or are some topics off limits? Is a hopeful ending vital in a YA book? Does a hopeful ending mean a happy ending? I can’t wait to get stuck into all this! I’ll blog about it after the event but for a sneak preview of some of my opinions on this subject, you can read a post I wrote for The Big Book Project recently. 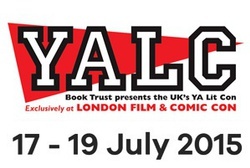 The full line up for YALC is now up on the Book Trust website – hope to see you there!